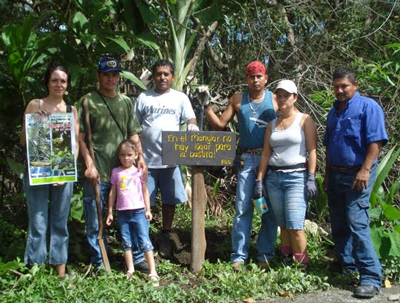 In three days in early August 2009, Friend of the Osa participated in awareness activities in Puerto Jiménez celebrating the International Day for the Protection of Mangroves. The Environmental Coalition of Puerto Jiménez delivered 50 mini waste collection centers to encourage garbage separation in households, and gave a talk about the importance of recycling and the impact of plastic bags on the environment. Pilar Bernal, our Environmental Education and Volunteer Program Coordinator, organized volunteers to pick up trash in areas next to the mangrove and install 15 signs with awareness messages about this critical ecosystem. FOO also organized a drawing and puzzle assembly contest with children. 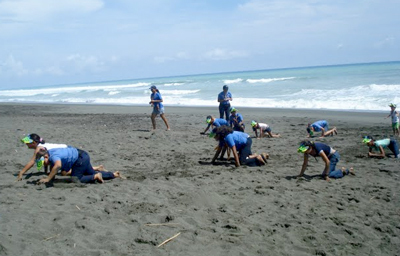 The Sea Turtle Festival in Playa Carate took place on September 27, 2009 in Carate Beach, organized by Pilar Bernal together with the Scouts from Puerto Jiménez and the Sustainability Committee of Carate. The documentary “The last voyage of Baula the Turtle” was screened, and there was a workshop to introduce the Sea Turtle Conservation Program in Piro-Pejeperro Beach. We also presented the Protocol for Construction and Management of Sea Turtle Hatcheries, supporting community initiatives to protect and manage nesting beaches. On October 3 2009, FOO staff and sea turtle program volunteers participated in our first Coastal Cleanup day as part of the international initiative by the Ocean Conservancy, the largest voluntary effort of its kind in the world. In 2008, more than 400,000 volunteers collected 3,650 tons of garbage from 6,485 sites in 104 countries. 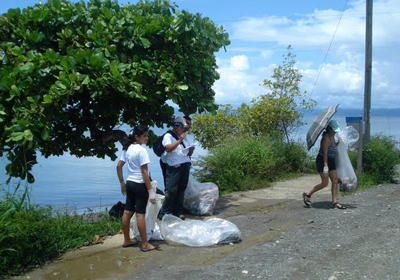 Along the Pacific Coast in Costa Rica, the cleanup took place along 13 sites in the Osa and Golfito cantons, and a river stretch in Pérez Zeledón.